Tons of Fun at Papa’s! 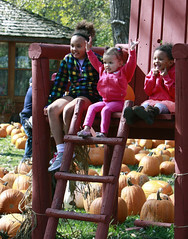 One of the things we hear most often from first-time guests to Papa’s Pumpkin Patch goes something like this: you are a LOT more than just a pumpkin patch! Truth is, that warms our hearts. 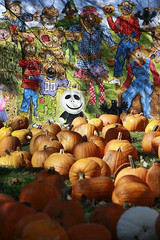 It also reminds us that we better let you what there really is to do on a visit to Papa’s Pumpkin Patch. First off, we’ve definitely got pumpkins…more than a dozen varieties each season. That means you’ll find tall ones and small ones, orange and white ones. We’ve got smooth pumpkins and warty pumpkins; pumpkins great for carving and others great for baking. We usually haul more than 300,000 pounds of pumpkins into the yards during the season! 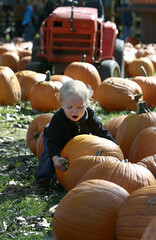 Next you’ll find all kinds of harvest-related produce like several varieties of squash and thousands of colorful gourds. We’ve got straw bales of differing sizes and corn stalks, broom corn and giant sunflowers to complete your fall display. What REALLY gets guests excited is all of the free activities you’ll find at Papa’s. 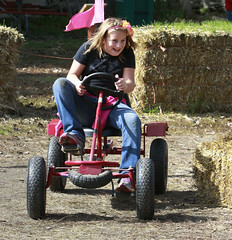 For example, we have a log gym, a nature trail, Papa’sville wooden play structures, a giant corn crib, the infamous bale mazes, a corn maze, a pumpkin trebuchet and a pumpkin cannon. All of these activities are free and open every day, with the exception of the trebuchet and cannon. They only shoot off on Thursday evenings and Saturdays and Sundays. Go to our Things to Do page if you want a complete list of all the extras you’ll find at Papa’s!